By having a healthy eating habit and doing daily exercises, there is no doubt that you will be healthy and far away from various kinds of diseases. Well, it is certainly easy to say, but it is sometimes very difficult to do. To make it easier, you may need to aim for small change first. Don’t force yourself to change your habit entirely for a healthier body and mind. In order to help you start your lifestyle change, this article will discuss about some of the simple tips for healthy body and mind that you can easily for your better state of body and mind. So, let’s check this out! Let’s begin from your body. There will be several tips that you can follow to make sure that you have a healthy body. Here are some of the tips. First, you should enjoy a small handful of nuts and//or raw seeds every single day. If you are searching for a snack in the supermarket, make sure that you opt for raw nuts and seeds rather than other choices. Never go for cookies and chips! No one will disagree that fresh fruit is a healthy treat for our body. To have a healthier body, it is recommended for you to consume fresh fruit twice per day. Try to vary the fruits color: think of fruits with green, orange and red colors for instance. You can consider berries, grapes, pears, apple, mandarins or oranges. In a day, you may eat so many things. What you need to remember is to fill a half of your plate with vegetables, a quarter of protein and then the rest is good carbohydrates. When it comes to vegetables, you should select veggies in a range of dissimilar colors like red, yellow, orange and green to make sure that you can get various necessary nutrients too. Protein is highly important for your body. Make sure that you opt for oily fish like tuna and salmon twice a week for a good protein source. Try your best to avoid red meat. You can have it for once in a week only. Instead, you can opt for very lean meat. 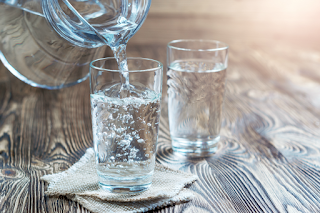 Water is other than vital nutrient that your body needs, so you need to make sure that you consume it at least six to eight glasses a day. Then, it is better for you to limit your intake on soda and coffee too. Instead, you are better to opt for vegetable juices and tea. For instance, you may order a Virgin Bloody Mary rather than a diet coke for lunch. Make sure that you always chew your meals well until it turn out to be soft and about liquid. It will be helpful for your digestion. More interestingly, you will be able to eat less too! Limit rich/fried and sugary food. One of other tips for healthy body is to limit your consumption of fried and sugary food. Keep away from butter basket and bread at restaurant. You better change your rich-calorie food with a healthier food. In addition to our healthy body, we need to mind about our mental health as well. One of the most possible problems when it comes to our state of mind is stress. To help you achieve the most of your health, here are some of the tips for reducing stress. Try practicing deep conscious breathing during your day. You will be amazed how powerful it is for your body. You can do this anytime and anywhere you can. Try this one-breath meditation especially when you feel exhausted. Being active is another way to deal with your stress day. You can be active as much as you can during your day. Add movement to your life by taking stairs rather than the elevator. Then, you can also consider walking from your home to the office if it is possible. Spend at least 30 minutes every day for regular quiet time. In this case, you may need to turn off your phone and then let everyone to know that you don’t wish for being disturbed at that time. You can do things like praying, meditation, listening to music and whatever making you enjoy. Think about three things that make you feel grateful in your life right in the morning after bed and right before you go to bed at night. Having a good sense of humor is highly important to keep your day stress free. You can also try to sing or hum a happy song whenever it is possible. And, don’t forget to smile too. Your home shows how you are. So, it is better for you to maintain your home in a good order to make you stress free. Just imagine how stressful you are when you come home after such a exhausting day and your home is in a mess. That’s why keep it in order! As a social animal, there is no doubt that we have other around us to be engaged. When it comes to your boy or girlfriend, your husband or wife, your parent, children, sister, brother and other around you, make sure that you maintain a good relationship with them. That’s all some of the tips for healthy body and mind. That sounds easy, isn’t it? You can start one by one and then make it as a long-term habit for a healthier body and mind. Remember to not force yourself and go by the flow. The last but not least, good luck! 0 Response to "Simple Tips for Healthy Body and Mind that You Always Need"